Approx. 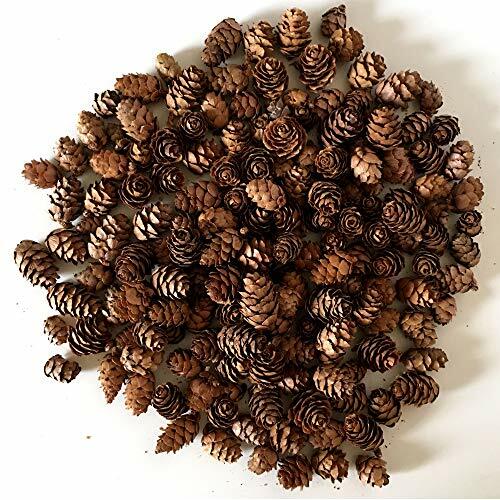 200 small brown pinecones (about 1/2 lb) each pine cone is REAL and measures anywhere from ¼" to ¾"H. NOTE: due to the nature of the product, size, color, and condition may vary. MINIATURE BROWN pine cones measure from ¼" to ¾"H and this lot contains approx. 200 small brown pinecones (about 1/2 lb). Perfect size for DIY POTPOURRI. BULK SET OF small, natural pine cones. These are the perfect winter wedding accent. Add them to a bunch of mason jars and candles to create a beautiful centerpiece. CHRISTMAS and fall pine cones with a natural brown color. These are REAL pine cones. VASE FILLERS or table scatters. Use them as a decoration for Thanksgiving, Christmas, holiday party or woodland or lodge themed room.